Its time to break for Snacks. Here are some Juices and Nachos along with Dip for you. Yes, this picture contains these snacks is also contains a very tough picture puzzle which only genius can crack. In this picture five letters of word "NACHO" are hidden. Are you genius enough to spot all these five letters in this puzzle picture? Can you spot 5 hidden letters NACHO in this picture? 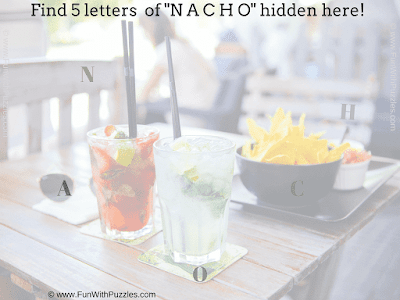 Answer of this "Hidden Letters NACHO Picture Puzzle", can be viewed by clicking on button. Please do give your best try before looking at the answer.